Idaho is a state located in the Pacific Northwest region of the United States and shares borders with the states of Washington, Oregon, Montana, Wyoming, Utah and Nevada (map). A small part of Idaho's border is also shared with the Canadian province of British Columbia. The capital and largest city in Idaho is Boise. As of 2011, Idaho is the sixth fastest growing state in the U.S. behind Arizona, Nevada, Florida, Georgia and Utah. 1) Archaeological evidence shows that humans have been present in the region of Idaho for many thousands of years and some of the oldest human artifacts in North America have been found near Twin Falls, Idaho (Wikipedia.org). 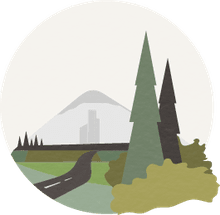 The first non-native settlements in the region were predominantly those of French Canadian fur trappers and both the United States and Great Britain claimed the area (which was then a part of the Oregon Country) in the early 1800s. In 1846 the U.S. gained control over the area and from 1843 to 1849 it was under the control of Oregon's government. 2) On July 4, 1863 the Idaho Territory was created and included present-day Idaho, Montana and parts of Wyoming. Lewiston, its capital, became the first permanent town in Idaho when it was established in 1861. This capital was later moved to Boise in 1865. On July 3, 1890 Idaho became the 43rd state to enter the United States. 3) The 2011 estimated population for Idaho was 1,584,985 people. According to the 2010 Census about 89% of this population was White (usually also includes the category of Hispanic), 11.2% was Hispanic, 1.4% was American Indian and Alaska Native, 1.2% was Asian, and 0.6% was Black or African American (U.S. Census Bureau). Of this total population, approximately 23% belongs to the Church of Jesus Christ of Latter-day Saints, 22% is Evangelical Protestant and 18% is Catholic (Wikipedia.org). 4) Idaho is one of the most sparsely populated states in the U.S. with a population density of 19 people per square mile or 7.4 people per square kilometer. The capital and largest city in the state is Boise with a city population of 205,671 (2010 estimate). The Boise-Nampa Metropolitan area which includes the cities of Boise, Nampa, Meridian and Caldwell has a population of 616,561 (2010 estimate). Other large cities in the state include Pocatello, Coeur d'Alene, Twin Falls and Idaho Falls. 5) In its early years, Idaho's economy was focused on fur trading and later metal mining. After becoming a state in 1890 however its economy shifted toward agriculture and forestry. Today Idaho has a diversified economy that still includes forestry, agriculture and gem and metal mining. Some of the state's main agricultural products are potatoes and wheat. The largest industry in Idaho today however is the high tech science and technology sector and Boise is known for its semiconductor manufacturing. 6) Idaho has a total geographic area of 82,643 square miles (214,045 sq km) and it borders six different U.S. states and the Canadian province of British Columbia. It is completely landlocked and it is considered a part of the Pacific Northwest. 7) The topography of Idaho varies from but it is mountainous throughout much of its area. The highest point in Idaho is Borah Peak at 12,668 feet (3,861 m) while its lowest point is in Lewiston at the confluence of the Clearwater River and the Snake River. The elevation in this location is 710 feet (216 m). The rest of Idaho's topography consists mainly of fertile high elevation plains, large lakes and deep canyons. Idaho is home to Hells Canyon that was carved out by the Snake River. It is the deepest canyon in North America. 8) Idaho is home to two different time zones. Southern Idaho and cities such as Boise and Twin Falls are in the Mountain Time Zone, while the panhandle part of the state north of the Salmon River is in the Pacific Time Zone. This region includes the cities of Coeur d'Alene, Moscow and Lewiston. 9) Idaho's climate varies based on location and elevation. The western parts of the state have a milder climate than the eastern portions. Winters are generally cold throughout the state but its lower elevations are milder than its mountainous regions and summers are generally warm to hot throughout. 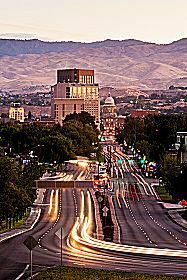 Boise for example is located in the southern part of the state and sits at an elevation of about 2,704 feet (824 m). Its January average low temperature is 24ºF (-5ºC) while its July average high temperature is 91ºF (33ºC) (Wikipedia.org). By contrast, Sun Valley, a mountainous resort city in central Idaho, is at an elevation of 5,945 feet (1,812 m) and has an average January low temperature of 4ºF (-15.5ºC) and an average July high of 81ºF (27ºC) (city-data.com). 10) Idaho is known as being both the Gem State and the Potato State. It is known as the Gem State because almost every type of gemstone has been mined there and it is the only place where the star garnet has been found outside of the Himalaya Mountains. To learn more about Idaho visit the state's official website.